The Cool-Flo System uses turbulent fluid properties to provide efficient heat conduction within the Cool-Flo finned heat sinks. Chilldyne’s proprietary turbulator technology creates a turbulent flow within the passages of the heat sink once coolant is introduced to the system. This allows the pistonless pump to operate at a low flow rate, reducing power consumption and demand on the pumping system. The system operates at low flow rates due to proprietary turbulator technology, which reduces demand on the pumping system and minimizes maintenance. The negative pressure pump system allows for automatic verification of system integrity upon initial deployment as well as for every re-start of the system. 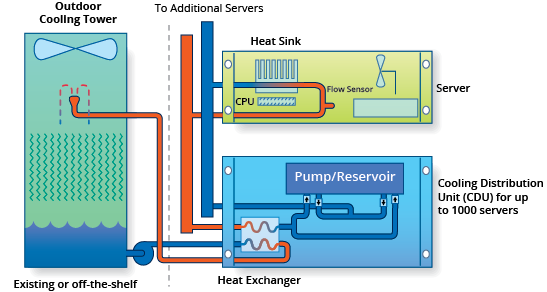 The No-Drip Hot Swap Connector automatically evacuates the coolant from the server when disconnected from the system. This allows technicians to perform maintenance as they would on any standard server without a concern for coolant being present. Chilldyne’s turbulator technology allows for completely passive components within the server - there is no need to use power from the server to power any elements of the system.